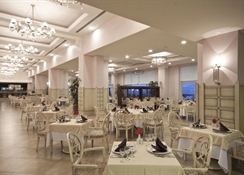 The Starlight Resort & Convention Centre is perfectly situated right at the seafront of the popular tourism centre of Kizilagac, 12km from Manavgat and ancient cities like Side, Aspendos and Perge. Warm and welcoming with a comprehensive Thalasso and spa centre, this ultra-all-inclusive hotel is part of the World of Sunrise, perfect for couples and families looking for plenty of opportunities for fun and frolic. All 811 rooms are situated between the main building and the two-storied club rooms are beautifully located amid the gardens. The 5-Star Ultra-All-Inclusive service ensures a hassle-free environment ideal for leisure and business travellers alike! The main building has 25 rooms for conferences and meetings, and can seat up to 5,000 people. In addition, the hotel ballroom can accommodate up to 1,600 people. 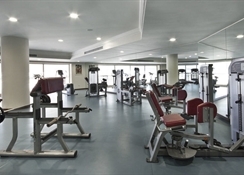 Facilities and services at the hotel include: 24-hour reception, express check-out, safe, currency exchange, lift, laundry & dry cleaning service, internet café, doctor on call, shops, hairdressing salon, disabled access, car parking. Guests at the Starlight Resort & Convention Centre can also use all the services at the nearby Hotel Sunrise Park Resort & Spa, also included in the system of World of Sunrise. The Starlight Resort & Convention Centre enjoys a beachfront location. 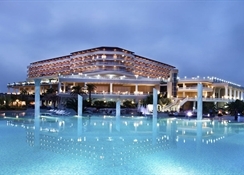 The Antalya International Airport is about 80km from the resort hotel. Nearby Side (pronounced see-deh) is one of those Turkish destinations that has it all, from ancient ruins through to pretty beaches. Check out the museum that is housed in the old Roman baths, and also the Temples of Apollo and Athena. The 811 guestrooms at the Starlight Resort & Convention Centre are categorised as Taurus view, Mediterranean view, junior suite, corner suite with sea view, corner suite with garden view, deluxe suite and king suite. All rooms have bathroom facilities (bath or shower, hair dryer, WC), air conditioning, desk and chair, electronic key card access, flat screen Satellite TV, mini bar, safe, telephone, and a balcony or terrace. Free baby cot on request. Please note: Duplex rooms have normal TV. Starlight Resort & Convention Centre presents an entertainment cave under a starry sky perfect for evenings with live music. There is an a la carte restaurant and a nightclub. The great variety of food will impress even the most refined gourmet. Guests can enjoy animation with evening and night shows, foam parties as well as live music and a disco. The Thalasso-Center has a Turkish bath, Turkish Hamam, steam bath, bio sauna, snow room, salt room, sauna, mud and seaweed rooms, showers jet, shower effusion, dark lounge, contrast showers, outdoor and indoor Thalassa pool with sea water Chroma-therapy, Ayurveda, Tepidarium, etc. Other facilities include: outdoor pool, playground, 15 tennis courts, three professional football fields, water sports, Boccia, basketball, mini football, Riding Club, squash, table tennis, fitness centre, Pilates, aerobics, badminton, speedminton, ice skating rink, bowling, billiards, beach volleyball, climbing wall, place for skateboarding, archery, waterpark, movie theatre, sports events and competitions, children animation, children’s club and mini-disco. Would definately recommend this hotel for family and couples as there are areas designated for both. Food was extremely varied and couldn’t fault it. Beautiful grounds and very well kept. Bungalows a little dated but more than adequate. Fridge being restocked was an added bonus.